As budgets become increasingly challenging, many schools are looking at staff and students bringing their own device into school to help with teaching and learning. 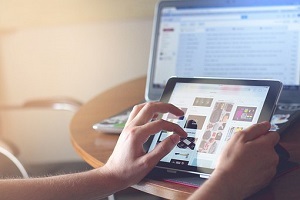 Bring Your Own Device (BYOD) is common in many organisations who feel that it is wasteful to supply employees with an additional device when they already own a laptop or tablet. For schools, this brings several challenges as senior leaders must ensure that they are not compromising safeguarding procedures if staff are using these devices in the classroom. A serious case review in South West England in 2012 highlighted that all staff need to ensure that the headteacher is aware and agrees to them using their personal device in school. Staff need to ensure that using their device doesn’t compromise the safeguarding of children. Therefore, images should not be taken on a personal device as this needs to be done on a school owned camera or tablet and kept on the school network. In addition, many documents are saved onto cloud based services and staff need to follow data protection procedures. No sensitive data is kept on the device or that any important information is encrypted. If the device is lost, the staff member will inform the headteacher as soon as possible. When a staff member leaves the school, they will ensure that all school information is removed from the device. Many members of staff now use their personal smartphone to access school based emails as it is easier to do this than to log onto a computer. Therefore, it is important that the school has a wipe facility in place (in conjunction with its ICT Technical Services) so that if the device is lost, the school based emails can be erased from the device remotely. Some schools are now allowing students to also use their own personal device in school to support them with their learning in the classroom. Schools that have developed this policy, usually implement a strategy beginning with the oldest students e.g. 6th form, KS4 and then look at phasing it in with younger students. Again, policies need to be updated such as the AUP and the school Wi-Fi infrastructure needs to ensure that pupils cannot access unsuitable content. BYOD is a good option for schools who may not have the resources to update ICT hardware. However, it is important that policies and procedures are updated to ensure that they don’t compromise the safety of children and young people. If you would like to share your thoughts or experiences of BYOD with fellow teachers, please use the comments section below. The Internet brings marvellous opportunities to children and young people with the ability to learn new skills and visit websites which engage and enrich their lives. However, the Internet also brings dangers such as online predators, who will try and contact children through websites and software apps. There have been cases in the news over the past year of groups like Islamic State (ISIS) using the Internet and social media to recruit young people to fight in the conflict in Syria. In addition, there are examples of right wing groups such as Britain First and the English Defence League using Facebook and Twitter to engage with internet users. On 1st July 2015, the Department for Education released their ‘Departmental advice for schools and childcare providers’ in the PREVENT Duty. 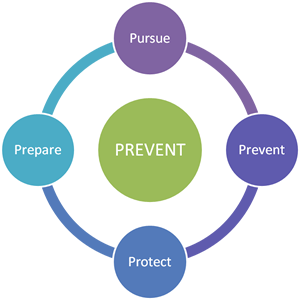 This guidance was issued to help childcare providers understand the implications of the PREVENT Duty and to help schools identify how they can protect young people from risk. In short, all schools have a duty under the Counter Terrorism And Security Act to keep children safe from harm, especially from the risks of radicalisation and extremism. It will come as no surprise that schools many have been left wondering where they will find the resources (both in terms of time and money) required to implement these additional requirements. The demand for information comes as no surprise to the team here at www.e-safetysupport.com. On the day we released our anti-radicalisation checklist for schools, we saw an incredible demand for the information - our website traffic was 600% greater than average, and over 10% of our members visited the site within 6 hours of the information being released. Due to this unprecedented demand, we have developed a school extremism and anti-radicalisation policy. The model policy can be used as a template and adapted as appropriate for your specific school needs. This policy is available exclusively to E-safety Support Premium Plus Members. 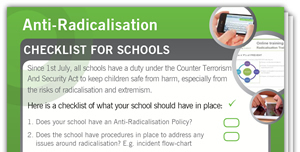 Don't forget to login and download your anti-radicalisation checklist for schools. This checklist will help identify the key elements your school should have in place. It is available to all E-safety Support members. To download the checklist, log into your E-safety Support account and go the 'Guidance' section of your dashboard. More extremism and anti-radicalisation resources will be added soon - find out more. This is the third in our series analysing the requirements of the Ofsted’s e-safety framework that was first issued to their inspection staff in September 2012. In previous articles, we looked at three sections of the framework policy document: 'Whole school consistent approach', ‘Robust and Integrated Reporting Routines’ and ‘Staff’. In this blog we are going to focus on two more areas, those being 'Policies’ and ‘Education’. It should be evident that contributions from students/staff and parents have been made to the content and construction of these policies by the whole school. - A good idea is to engage students in classroom activities focusing on what they believe would be important in policies regarding subjects that directly impact them such as e-safety, school filtering and ‘Acceptable Use Policies’. (These lessons should be recorded in some way so that the evidence can be shown to Ofsted during an inspection). - Parents and carers should be invited to attend meetings and asked for their input into designing school policies (These events should also be recorded for evidencing). Policies should be specific with regard to individual responsibilities and behaviour, technology usage etc. They should not be just generic documents. - A useful suggestion is to categorise a checklist of the policies your school should have into “data protection’, ‘e-safety’ and ‘acceptable use policies’. Then, subdivide the policies in each of these categories into ‘statutory’, ‘essential’ and ‘recommended’. - It is suggested that when the policies are revisited, updated and ratified, it should be carried out in a formal manner and the process recorded in some manner in order that the record can be shown to a visiting Ofsted inspector. The e-safety policies should have full integration with other relevant school policies such as those concerning safe-guarding, anti-bullying or behaviour. A particular important aspect in this area is the incorporation into the overall e-safety policy of an ‘Acceptable Usage Policy’ that every pupil and/or parents respect and have signed. This also applies to all school staff as well. - In the case of students, they should be asked to sign the school AUP at the start of their time with the school. It would be helpful if parents countersign the document also. The schools curriculum should demonstrate progressiveness and flexibility with regard to the promotion of e-safety across the whole school. - Evidence of this could include a programme of key-stage specific e-safety lessons and assemblies that occur regularly throughout the school year. The E-safety Support website offers a number of informative lesson plans and assembly plans, for this purpose. The curriculum is relevant and engages students by teaching them the importance of e-safety and how to stay safe when using technology. - Lesson resources focusing on e-safety should be age-related and revisited regularly and up-dated if necessary as technology advances or new technology-orientated issues arise. - Another suggestion is to engage students (maybe those involved in school councils etc.) in drawing up a school e-safety charter. The curriculum should have content embedded that teaches students how to protect themselves from harm with regard to issues such as cyber bullying or contact with individuals who are behaving inappropriately. - A suggestion is to use ‘what if’ case studies in lessons to teach students what the appropriate actions to take should they find themselves in circumstances that they are uncomfortable with. Content within the curriculum should inform students of the importance of taking responsibility for the safety of both themselves and others. - This issue can be incorporated in lessons and associated resources focusing on the development of knowledge and skills associated digital literacy and responsible use of the internet. With regard to e-safety, the curriculum should demonstrate the use of positive sanctions to reward responsible use of technology and online behaviour. - A suggestion is to reward good online behaviour with an invitation to be involved in online communities who promote appropriate online behaviour such as the ‘Scratch’ community. (This would require a parent or carer’s formal permission). The curriculum should demonstrate clear evidence of peer-mentoring programmes. We hope that you find these suggestions helpful. Please feel free to comment on the blog or if you have some other great ideas for embracing or engaging with the Ofsted e-safety framework within school please feel free to contribute below.